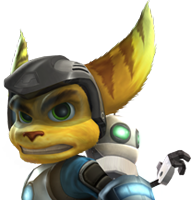 Kind of stole this idea from another website, but I think it's fun to ask the same question here: What do you absolutely not want to see in the new Ratchet & Clank for PS4. Whether it be a certain character, mechanic or Captain Qwark etc. You name it. Keep it clean guys, don't go to hard on eachother. I don't want to see any returning weapons, or at least ones that are not from the first game. I just said the Combuster because that's the weapon that's appeared in pretty much every single game after its debut. And I want dubstep to stay VERY far away from this game. I don't want to see Ratchet having any romantic interests. And I don't want Courtney Gears to appear. Add that to the fact that the Ratchet all 4 one art-style is in the ps4 screenshot we saw…. I don't want the Combustor, or any serious love interests. +1. Looks like we stand on the same side. Anything that says "aimed at children" I want the T for Teen Rating back. I'd also like to add campaign story DLC. I want none of that. +1. Unless the DLC is more like a sauce for a burger - meaning it's just an extra stuff and cheap. Remember when games you released, you bought them one time and they were complete? Yeah, I wonder what happened to it. Even when you buy a burger, you get the sauce when you buy it.